This year Score was visited by Professor John W. Meyer, Stanford University. See the film from the lecture. 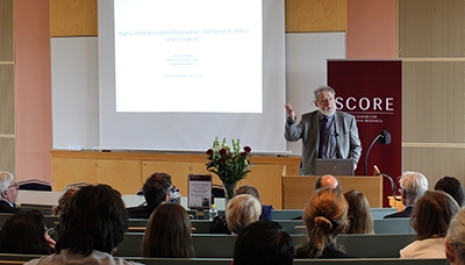 About every second year, Score hosts a Score Lecture on Organization, to which a distinguished international scholar is invited to present his or her research on organization. Score Lectures on Organization are open to a wider audience. This year Score was visited by Professor John W. Meyer, Stanford University. Contemporary organizations are, in good part, constructions of organizational theories, which thus have an interdependent relationship with their objects of study. An older modernity imagined bureaucracy, for better or worse, as canonical. The breakdown of this model in the post-War period, generated models of organizations as more or less rational, autonomous and responsible managed "actors" interdependent with their environments. The worldwide success of such notions and organizations in every social sector reflecting them -- indicated, for instance, by the explosion of business schools around the world -- generates greatly expanded responsibilities for such "actors," and densely organized environments asserting these responsibilities. So contemporary organizations theory is filled with depictions of complex environments, multiple and inconsistent logics or orders of worth, and the resultant limited or "partial" possibilities for coherence. The rather fragile structures that result depend heavily on cultural legitimacy rather than clear functional justifications. As the legitimacy involved weakens in a post-neoliberal period, substantial changes in organizational theories, models and ideologies should follow. Some possibilities are discussed.